In the period between 1950 and 1970 the Snowy Mountains Hydro-electric Authority constructed no fewer than 120 camps and work sites in the Snowy Mountains from Blowering in the north to Ginninderra near Canberra, Khancoban in the west, Pilot in the south and Cooma in the east. 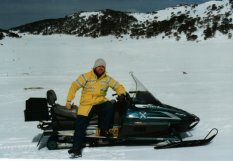 In the area of Mount Kosciusko there were a total of 19 camps including ones at Island Bend, Crackenback, Smiggin Holes, Guthega, Spencers Creek and Perisher. In the years after the completion of work the roads into this area drew tourists and skiers so that now the old campsites of Perisher, Guthega and Smiggin Holes as well as Charlottes Pass and Mount Blue Cow have become the centre of Snowy Mountains skiing. All these sites are located above the snowline and consequently in winter they attract thousands of people both from Australia and from overseas. At the heart of this complex of snowfields is Perisher Valley – made famous in recent times by the fact that Kerry Packer, Australia’s richest person, owns a lodge and has a major interest in the ski lifts. It has been claimed that the Perisher valley was named by James Spencer, who had settled in the area in the 1840s, when he was caught in a storm. His comment ‘What a perisher’ is probably apocryphal but it is a reasonable account of both the weather and the location. The first ski lodges in the valley opened in 1951 and by 1957 there were a number of ski clubs operating. Since then it has continued to grow so that today it is widely regarded as the premier ski spot in the Snowy Mountains. Unlike Thredbo it is not a 12 months of the year resort and looks a little like a ghost town during the summer months. In winter, however, it has 30 interconnecting ski lifts, over 100 ski instructors, extensive snow making facilities, and a wide range of accommodation options. The settlement boasts the two highest churches in Australia and a ski lift which rises to 2054 metres (only 174 metres below Mount Kosciusko). Of greatest interest to non skiers is the remarkable Skitube which runs from below the snowline at Bullocks Flat, across the Thredbo River Bridge and through the mountains to Perisher Valley and Mount Blue Cow. 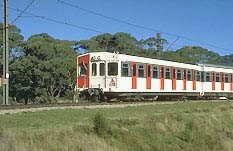 Claiming to be Australia’s highest rack railway system it is an 8.5 km journey through the longest railway tunnel (a total of 6.3 km) in the country. Bullocks Flat terminal is 1120 metres above sea level and the terminal at Mount Blue Cow is at 1875 metres – a total climb of 755 metres. It operates all year round and, for visitors in summer, offers an interesting journey as well as an ideal start on the climb up Mount Kosciusko. There is a bus service which runs from Perisher Valley to Charlottes Pass from where it is an easy 8 km walk to the top of Mount Kosciusko. In spring and summer the walks in the area are exhilarating. The alpine flowers are dramatic and the views are often spectacular. Smiggin Holes (not Smiggins Holes) was named after the pools which were formed in the rocks in the area by cattle. The name apparently is Scottish in origin. Now a popular ski resort it claims the best beginners ski run in Australia as well as excellent facilities for more advanced skiers. Located only 40 km from Jindabyne Guthega was one of the first camps in the Snowy Mountains. As early as 1955 power was being generated by the Guthega Power Station. The area was originally called Munyang after the Reverend William Branwhite Clarke (an early explorer in the region whose expertise in geology led to hist discovery of gold in the Bathurst area long before the first gold rushes) had named it after an Aboriginal word which he spelt ‘Muniong’ and claimed meant ‘big white mountain’ in the language of the locals. Guthega is primarily a day ski resort. Accommodation is restricted to the Guthega Lodge and Restaurant with most skiers staying at Jindabyne or Berridale. In comparison to Perisher and Thredbo it is a small ski resort with limited facilities. Mount Blue Cow boasts that it is the newest ski resort in New South Wales. It is a unique experiment in cooperation being a joint venture between the Mount Blue Cow Ski Bowl company and NSW National Parks and Wildlife. Located between Perisher Valley and Guthega it is 1875 metres above sea level and is only accessible by the remarkable Skitube which runs from Bullocks Flat near Jindabyne. It has no overnight accommodation and is designed to cater for day skiers in the winter and walkers in the summer months. NPWS are proud of the fact that Blue Cow is an area where 150 year old snow gums still exist (in other parts of the Snowy Mountains they have been cut down or burnt by bushfires) and where the alpine water skink and the rare mountain pygmy possum have their home. NPWS have produced a free brochure on the area. In recent times Charlottes Pass has become both a popular ski resort and a favourite departure point for the leisurely 8 km walk to the top of Mount Kosciusko. Philip Francis Adams, the District Surveyor at Cooma, brought a group to the area in 1881. He named the area after his daughter Charlotte who accompanied the group.